-SG- Back in 1931 my good friend Jack Bindley went to the Isle of Man for the third time - I think on one of the special trips TT trips then available at a special price from 'Motor Cycling.' He was given a small booklet published by the Leicester Rubber Company - aka John Bull - containing the names of the riders and other useful TT information, plus of course details of John Bull's range of products at the time. Apart from tyres, one of the products we are all familiar with is the George Dance knee grip, fitted to virtually all Vintage machines with sporting pretensions. But one of their other accessories was a rubber boot to fit onto a Sturmey Archer gear change lever of the twenties type - or, for that matter, any gear lever with a knob of about the same size. 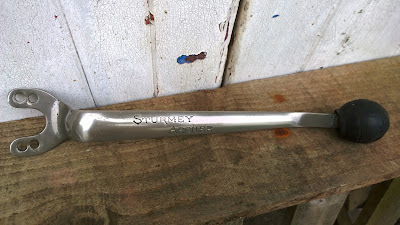 By sheer co-incidence I received the photo attached the other day - showing a new Sturmey lever complete with rubber boot which a friend of mine has just acquired. Hate to think what it cost! Anyway, this prompted me to unearth Jack's 1931 booklet and scans of it are also attached - click this link. Incidentally I know of just two other of these rubber boots to have survived - one in NZ and one in Northern Ireland and both on Nortons - but there are doubtless others out there somewhere, some more perished than others!